Check to see if you have more than one Track name event in your EVENTS track. If so, keep the one named EVENTS and delete or fix the others. When you edit in Reaper, open the EVENTS MIDI item in the MIDI Editor. It will be easier to find erroneous events if you change it to event list view mode. I don't literally mean the same name, I meant more than one of the same event type. Each MIDI item should only have one Track name event it represents. PART GUITAR should only have PART GUITAR for a Track name event. All other Track name events must be deleted. Try to clean the midi or remove ilegal markers with C3CONTool or CAT. Looking at your screenshot again, you don't appear to be using a recommended version of Reaper (4.22, 32-bit). If you switched to that and set up your authoring space around that, it will be easier for us to help you. Ok, I've switched to 4.22, now what? After clicking 'Export project MIDI...', be sure to select 'Multitrack MIDI file' under 'Consolidate output'. 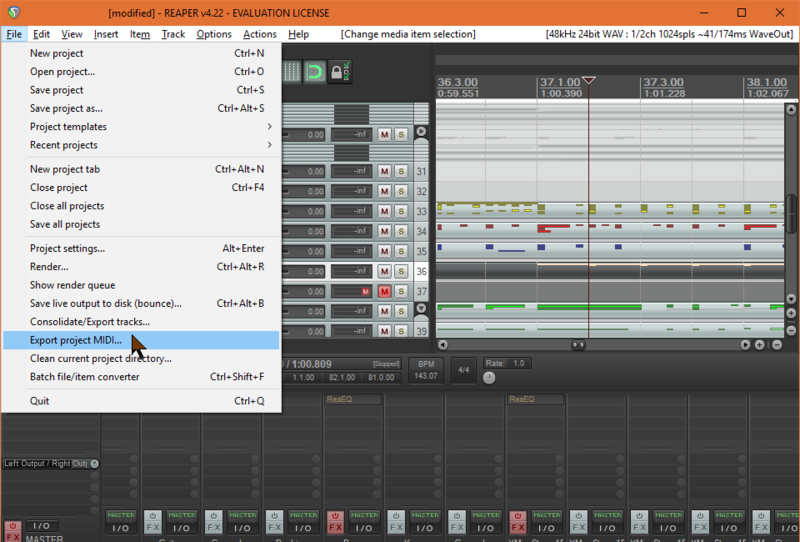 REAPER will then output a type 1 MIDI file.